Transforming the health care system is no easy task. It’s going to take a powerful coalition to fight back against the interests of insurance & pharmaceutical companies. That’s why SMWC prioritizes working with other organizations who share a belief that health care is a human right and a commitment to advocating for universal publicly funded health care. Locally SMWC is a member of the Maine Health Care is a Human Right Coalition Steering Committee along with Maine AllCare and the Maine State Nurses Association. We are hoping to expand the coalition with endorsing organizations from across the state. If you’re organization is interested in endorsing the Maine HCHR Coalition please contact us. To learn more about the Maine HCHR Coalition, visit our website or Facebook page. Nationally, SMWC is part the Health Care is a Human Right Collaborative with the Vermont Workers’ Center, Put People First! 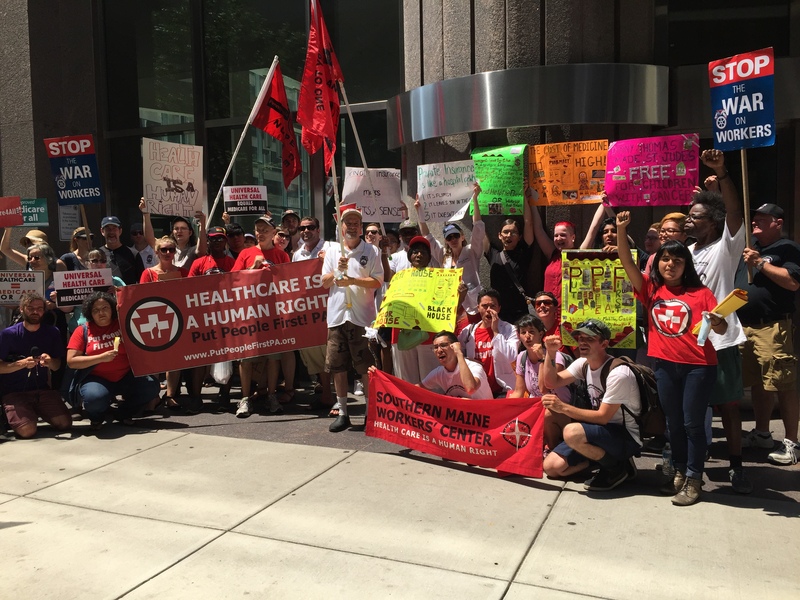 -Pennsylvania, and the National Economic and Social Rights Initiative (NESRI) that collectively strategizes and strengthens one anothers movements, while raising the national profile of the call for truly universal, equitable health care. You can visit the HCHR Collaborative website to learn more about this powerful movement.